WRVAP attended the NSW Planning Assessment Commission hearing on 30 June and 1 July 2015 in the Hunter Valley town of Singleton to hear community response to Rio Tinto's proposed expansion of its open cut mine in the form of its Warkworth and Mt Thorley 'Continuation Projects'. 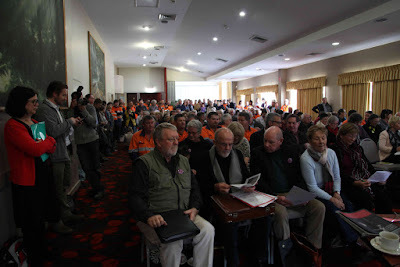 The audience was packed, and included many who must have rushed straight there from work without having time to remove their orange high vis jackets, and which incidentally had the effect of showing that some locals are employed by the Rio Tinto mine. There were nearly two days of 5-minute responses to the proposal to expand the Rio Tinto open cut mine. The PAC heard about the contribution this expansion will make to climate change through the burning of more coal, the impact on traditional owners' responsibility to care for the land, and other damage it will do to the surrounding land, including to rare and unique ecosystems and economic viability of farm businesses. 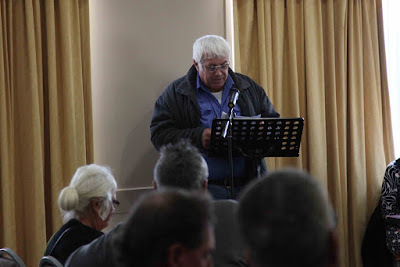 WRVAP contributed two responses—by David Watson and Margaret Roberts.